The ending of this book quite possibly made me giddy. 3.5 stars.2012 - The year of the villain? One could only hope. Real villains are due for a comeback. Not the good boy turned bad type of character. I'm talking rotten to the core villains. The kind we love to hate. The kind we all hope have no redemption, other than the sort which involves a shallow grave.If the ending of book 1 is any indication, I do believe we have the possibility of getting to read about one extremely disturbed villain in book 2. Again, I repeat...one could only hope. Alchemy starts off seemingly innocent in tone. We're several hundred years in the past. A cute girl (Sera) meets a charming boy (Cyrus). After an "incident," he offers her the chance to live again. She ponders the notion that she is destined or fated, or some other swoony term which would imply that she might enjoy being linked to this wonderful young man.Fast forward a few centuries. Sera's life is now a life of torture and imprisonment. Apparently, her fairy tale didn't come true. Now she has to make a choice - does she live in captivity, or die to gain freedom?No book like this would be complete without a wrench in the game plan, of course. Through a twist of fate (or just bad luck), she ends up in the body of a teen. 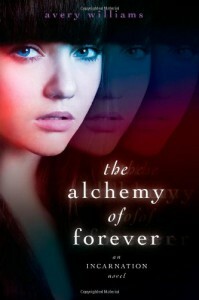 But her ties to Cyrus will not be so easily broken...The Alchemy of Forever had some great starter ideas for a story. I wasn't quite sure how everything was going to be played out. Was the author going to take the obvious pnr route and play up to the "love conquers all" theme? Would stereotypes abound, leave me feeling like I'd read this someplace else, just wrapped up in a different pretty package?Fortunately, a lot of the dilemmas plaguing the YA market were not present in this book. No instalove, no triangles, no bouts of pining. If I had only one complaint, it might be that the age of the character and her potential love interest were so young (16 and 17). I might have preferred the story just a little bit more if the characters were a year or two older. Maybe if "Kailey" (the girl whose body was snatched) was just turning 18 and about to graduate high school, and Noah was in college or something. It's not a huge complaint, but it's very hard to grab on to the notion that a 600ish year old person would be crushing on the underage boy next door.On the one hand, the transformation from Sera to Kailey was a bit too tidy for my liking. On the other hand, I sort of understood why it might not be as big of a deal as I was making it out to be. When "Sera" was originally turned, she was an innocent 14 year old. As the years progressed, she was taught book smarts, but never street smarts. She had always been under Cyrus' thumb to the point of never learning how to take care of herself. In this aspect, she was still a child, and she might have had an easier time coping if thrown into a family situation with rules and boundaries, where she could learn the outside world a little bit at a time. If that's how we want to look at it, then everything starts to make more sense.Even with my brain struggling to process the idea of Sera being okay with the teenage life, I still found the story itself to be one that I wanted to follow. I want to know what havoc Cyrus is going to cause for her in her new life as Kailey. The man is twisted. After the end made me fear for one person's life, I'm going to be anxious to know what happened to that person. Bring on book 2. I need answers!